Flower stems grow to 60cm, but are often absent - see the last 3 photos below. [The larger dirtier leaves are not of Musk stork's-bill, nor are the yellow and white flowers]. Flowers lilac in colour - stalks (if present) are glandular hairy. The leaves are are in a basal rosette (here reaching upwards out of the gloom) and have un-evenly alternate leaflets with short stalks. Flowers have 5 long lilac-coloured petals. Unlike some Stork's-bills, the flowers are not hemi-zygomorphic, but symmetrical and actinomorphic. Just below are the folded sepals containing flowers yet to emerge: the fawn-coloured stigmas are poking out from the top, whilst the 5 sepals have unusual and longish tubular-like protruberances at their tips (see photo immediately below). Very unusually for a plant, the tips of the sepals are crimped or folded into a narrow thin almost tubular projection at their tips, each with a short brownish tip. The outside surface of the (here canoe-like) sepals is covered in sticky glandular hairs. It might be these glandular hairs from which a musky smell evaporates, and the reason it has the common name Musk Stork's-bill. There are 5 stamens with deep-yellow pollen; they alternate with 5 staminodes (infertile stamens). Lurking amongst them somewhere is a style with 3 pale stigmas. Flower buds with brownish tips of their sepals peeking out (see photo below), but nowhere near China. The seed pod beaks (the long narrow part) are long (2 to 4.5cm - slightly longer than the only other Stork's-bill (Common) with similar length beaks (1.5 - 4cm long), straight and with a linear taper to their tips which still have the stigma attached. The seed pods are called 'mericarps' and contain many seeds attached to beaks. The seeds are explosively catapulted from the column far and wide. As the seed pods grow longer, their three stigmas gradually wither to just a stub. They emanate from within their sepals which have since re-folded into a tight cylindrical form they assumed before the flowers before them unfolded. The sepals are still covered in a mass of short hairs, as is the main flower stem, as are the multitudinous short, thinner and brownier flower stalks (petioles) than still hold them. Eventually it seems the sepals fall off from around the fruit and seed pod leaving 5 whisker-thin tendrils behind and a thin, translucent covering around the lower bulge from which the extraordinary long seed pods project. The hairs are all seen to have tiny, sticky, glandular globes at their ends. The semi-translucent sheath left around the wide part of the fruit has longer hairs (lacking the sticky glands at their ends of other parts) and which are parted laterally and combed flat tangentially away from the 5 slightly-raised midribs of the semi-translucent sheath. Somewhat sprawling leaves. A flower can just be made out just north of centre, but most flowers have fruited. Six or seven sets of long fruits discernible photo plus one flower still present. The leaves, 10 to 45cm long, are green or greyish-green, with just a few leaflets (4 to 7 pairs) which are alternate (but nearly opposite near the end). The leaflets have an ovate outline. The lobes of the leaflets (usually cut less than half-way to the midrib) are also oval but also with smaller blunt teeth. The hairs on the leaves are minute and glandular (not discernible from this photo). Most of the flowers have started to fruit, with their conspicuously long needle-like projections. Not all flowers possess stalks; some are stalkless, as these fruits plainly show, growing out from the soil. 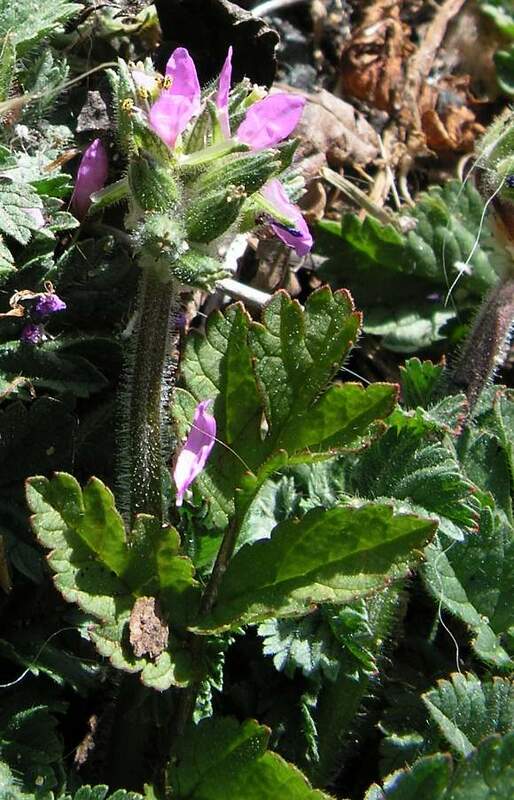 Resemblance to : Sticky Stork's-bill (Erodium lebelii) which also has sticky glandular hairs where sand grains are always adhering to it. However, Musk Stork's-bill has flowers that are a deeper purplish-pink colour, the flowers are actinomorphic (not slightly zygomorphic) and the petals never ever have black spots (sometimes Sticky Stork's-bill has a black or indigo-coloured spot on just 2 adjacent petals), and although Musk Stork's-bill has sticky-hairy flower stalks (when present, often the flowers are stalkless) the leaves are not that sticky (whereas they are sticky on Sticky Stork's-bill), also the leaflets on Sticky Stork's-bill) are more-deeply cut. The fruits on both are a similar 2-4cm (up to 4.5cm on Musk Stork's-bill). It is one of the few flowers which are increasing in number and in range of occupation. As an archaeophyte it inhabits open grassland, waste ground, lawns, field edges, on bare or sparsely grassy areas usually near the sea (as does Sea Stork's-bill (Erodium maritimum). As a wool alien it is usually found on arable farms, especially on any fields manured by shoddy (shoddy is shredded waste wool used as a manure). It smells slightly musky, hence its name.